Syracuse University is using two Hitachi Z-HD5000 HDTV broadcast cameras to produce select Syracuse Orange NCAA Division I athletics events for ESPN3, ESPN’s online streaming service. The events include men’s and women’s basketball and lacrosse games held at the Carrier Dome. Syracuse University is a private research university located in Syracuse, NY. 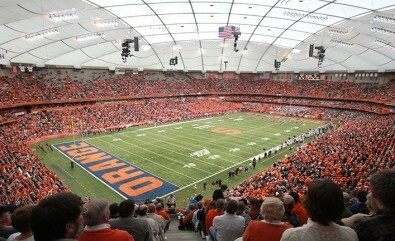 The university’s Carrier Dome stadium seats 49,000, and is the largest structure of its kind on a college campus. When ESPN first contracted with the University to carry select Orange games on ESPN3, they provided a list of video equipment they wanted them to use on their productions, including the Hitachi Z-HD5000s and two Fujifilm Fujinon HA42x9.7BERD lenses. “We acquired the cameras as part of a broader video production upgrade we did specifically for the ESPN3 contract, and they have performed exceptionally well,” DeFrancisco said. “Having ESPN3 carry our games live is prestigious and provides greater visibility for our teams,” said John DeFrancisco, Manager of Technical Operations for Syracuse University’s Carrier Dome, which houses a video production control room in one of its private skybox suites. The video operation is now responsible for live video production for ESPN3 broadcasts, closed circuit broadcasts to two HD Daktronics boards inside the arena, and webcasts of select games via its Cuse TV online streaming service. The University’s existing complement of five HD cameras now supplements the Hitachi cameras so they can provide more varied shots and angles of game action. The video feed is delivered to ESPN in real-time via the sports network’s own dedicated fiber lines. The two Hitachi Z-HD5000s are similarly configured, including 7in color viewfinders, tripods, and the Fujinon lenses with 2X zoom extenders and Digi Semi Servo lens controllers for ease of operation.